"follow up by service people excellent"
"Have already recommended your company and hopefully people..."
We used PolyLevel® Injection to lift an entire pool deck to improve slope, eliminate trip hazards and close up gaps in the coping. The lift ranged from one to 3 inches. Hi there. I'm looking for a quote to straighten out my garage walls. Over the past few years when there is a lot of snow that suddenly melts due to warm weather or a heavy rainfall, the basement fills with inches of water at the back of the house. It is a finished basement and there does not appear to be any visible cracks. Residential ravine lot property. Collapse of retaining wall. Need estimate for design and construction of retaining wall rebuild possible using helical piles (recommended by geotechnical assessment). Hello, We live in a semi-detached house and our and our neighbour's kitchens share the same crawl space. We discovered there is a small opening/broken board to the shared crawl space which raccoons have been using to enter the crawl space (under our decks). We are looking to close off the opening and ensure the crawl space has no issues, so we no longer have raccoons living under our kitchen. What do you recommend to do and what would the estimated cost be? A large crawlspace needs vast improvement. Looks like it needs roxul & roxul board. Waterproof basement and foundation repair. We had our sump pump replaced by Clarke a year ago. as well, we had a back up battery system put into place...the installers were on time, knowledgeable, efficient and answered all questions as well as offered advice and suggestions as to having regular maintenance. We spent four days without power last year at Christmas and thank goodness we had installed this system as it was in use all through the power outage. No more flooding! We just had our first annual maintenance and 'check up'. Matt, the serviceman was on time, called ahead of his arrival, was polite, answered all my questions and showed me exactly what he was going to do to check the system, and made sure that I not only understood how the system worked, but also what to do in case of emergencies. Thank you Clarke Basement Systems! We have already recommended your services to our neighbour, who is also very pleased with the service and installation. products and companies, and after comparison, I decided to call Clarke Basement Systems. Ali - Fereid performed the maintenance on our sump pump. He was on time, courteous and knowledgeable. The advanced education of the customer with the basement science book as well as the knowledge of the salesperson was a strong contributing factor. Rob was fantastic! Crew professional and diligent. Clarke Basement Systems is proud to serve our area because we’re committed to customer service. Our team of professional technicians use quality products from the best manufacturers in the business. We want to work with you to find a solution that will work best for you. 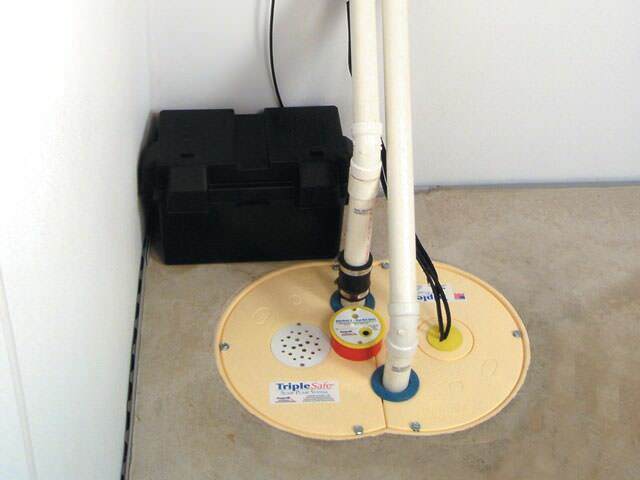 We also offer the excellent TripleSafe sump pump, uniquely designed with a primary pump, a secondary pump, and a third, battery operated backup pump to ensure that should disaster strike, your home is protected. Give yourself the peace of mind you deserve and trust Clarke Basement Systems to keep you basement dry for years to come! Issues with foundations are often caused by broken or weakened soil that can no longer support the weight of the structure. Some of the major signs of this are cracked floors or walls, tilting chimneys, street creep, or inward bowing walls. When this occurs, one of the ways to remedy the problem is to install foundation piers and helical piers which will correct uneven or sloping floors. GeoLock wall anchors are also good for fixing bowing, leaning walls, providing a permanent solution for foundation issues. Tired of tripping over uneven concrete on your sidewalks or patio? Then you need our PolyLevel concrete lifting, NexusPro cracked concrete repair, and SealantPro concrete sealing system. Our solutions are designed to be faster, easier, and more cost-effective than traditional methods of repairing concrete slabs, such as slabjacking or mudjacking. As an area of the home that can often be neglected, crawl spaces can easily fall into disrepair, causing more serious problems for other areas like the foundations. If you've noticed sagging floors above your crawl space, musty odors, or even mold growth, then it's time to get your home inspected by a specialist. 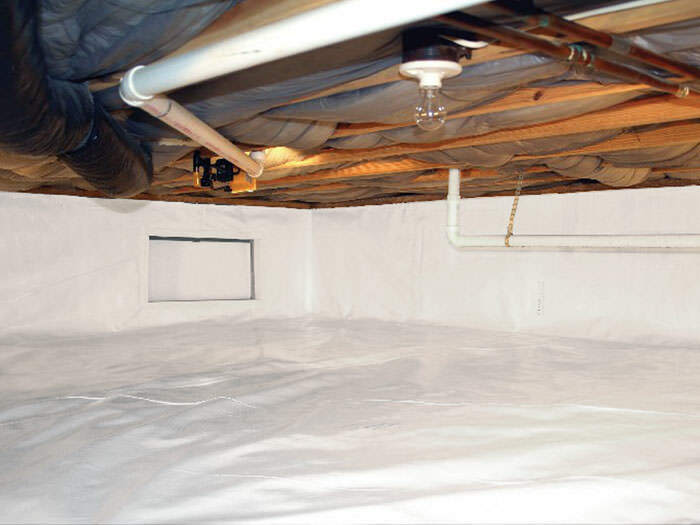 Our technicians can install vapor barriers, thermal insulation, and dehumidifiers to turn your water damaged, unsafe crawl space into a healthy, clean area. Mold damage and wood rot can be very destructive to crawl space support beams and can be very costly to replace. By having your home inspected by the professionals at Clarke Basement Systems, we can install products like jack posts to reinforce sagging beams while eliminating the source of the problem using insulation. Clarke Basement Systems has the tools and the expertise to get your job done right the first time. Our team of friendly, knowledgeable staff and certified technicians want to work to find a solution that will best fit your home and your budget! Call us today for a free estimate! We lifted a pool deck to remove trip hazards and the customer was very satisfied with the service provided by Clarke Basement Systems. Lift of an entire pool deck to improve slope, remove trip hazards and close up gaps in the coping. Lift ranged from 1" to 3". Our installers finished the repair of this pool deck which took only half a day to complete. At the recommendation of a friend who used your services, we would like to get an estimate to repair our basement back foundation wall. It leaks in a couple areas and we would like to find a solution to resolve the issue. Up until last fall the leaking was very minimal but over the winter the volume of water from the cracks has increased substantially. Hi, I hired a contractor to do some parging work and he has come up with an issue. He says foundation behind the parging is basically soft and crumbling. The loose material has been taken off so we would need someone to come and take a look to provide an estimate. I also have pictures I can send. Thank you! Our basement is finished but we have water come in whenever it rains. Not puddles but the walls, baseboards and carpet are damp in certain locations. We are looking to refinished the space but we want to ensure we fix the water issue first. Thanks! Crawl space under kitchen is not properly insulated. Want to insulate to ensure kitchen stays warm/cool when desired. Also, want to finish crawlspace floor as it is currently dirt. Thereby increasing storage space. We have a very damp basement (brand new house, original foundation) and want someone to come look to advise and quote on what could be done to improve it (we run the dehumidifier 24 hours a day and it fills completely twice per day). Mould in one corner of basement. Some grading issues in that corner of the house. Entire basement seems overly damp. Need assessment of entire basement.